I’d like to thank everyone who visited the exhibition, attended the opening, sent me messages, left comments on social media sites or otherwise supported me. It was a great first exhibition! 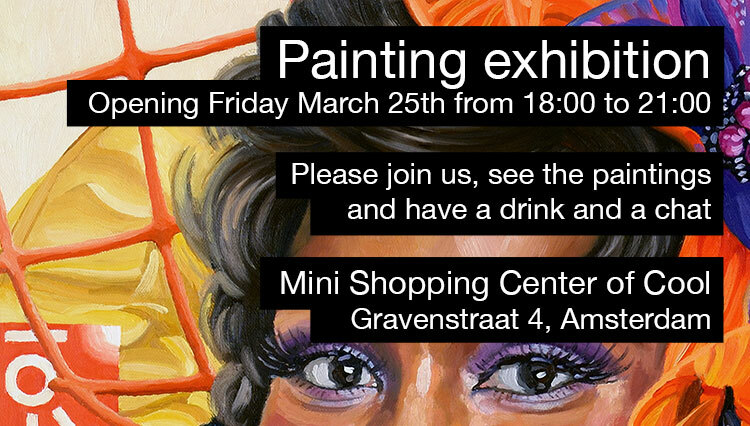 Friday March 25th the first ever exhibition of my paintings opens at Mini Shopping Center of Cool in Amsterdam. I’d like to invite everyone to come by, see the paintings, and have a drink and a chat. I’m very happy with this first opportunity to show my paintings in public at such a great place, and have just finished a new painting that’s not on this site yet and that I made especially for this exhibition. It’s the one of which you see a detail in the invitation image above. The opening will be from 18:00 to 21:00 and I hope to meet all of you there! Mini Shopping Center of Cool is located at Gravenstraat 4, right in the centre of Amsterdam just behind the Dam Square and Nieuwe Kerk. The Mini Shopping Center Of Cool (MSCOC) is the smallest creative shopping center of Amsterdam.The MSCOC is a platform for young and more established designers. My philosophy is very simple, unique, authentic, graphic design, hand made, printed and produced under their own supervision. No mass production. The items we sell are t-shirts, sweatshirts, accessoires, jewelry, leather goods, illustrations & art prints and books. Also, we organize exhibitions to promote new work. I really hope to see you at the opening! An interview with me was published last week on www.hkarttutoring.com. 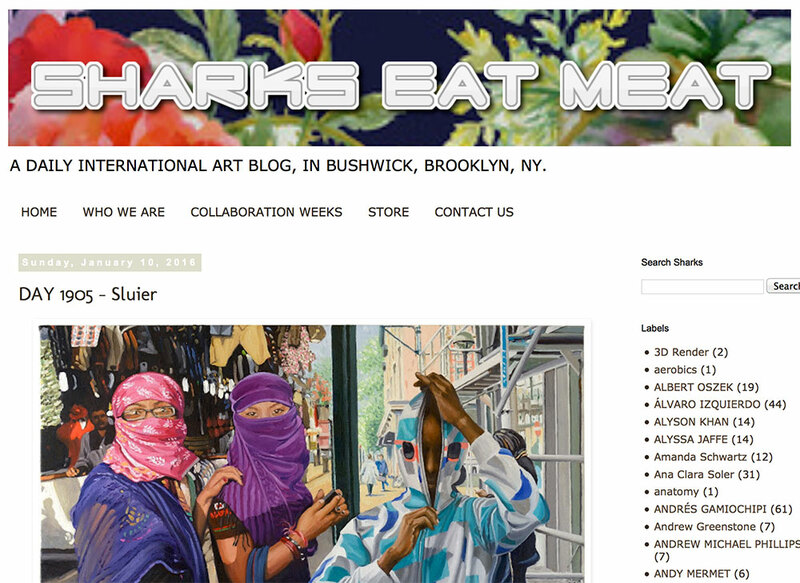 Sharks Eat Meat is a daily international art blog from Brooklyn, New York that shows one artwork per day, every day. Over the years it turned into a beautiful art collection and I was very happy to be asked to contribute. Curator John Aaron Coulter chose my painting ‘Sluier’ to be the artwork for day 1905, january 10th 2016! Sharks Eat Meat is a collective of contemporary artists who post new artwork every day through their blog. The website’s current curators are Ashly Bohinc and John Coulter. The blog features artists from all over the world and the collection includes photos, paintings, prints, videos and animations, sculptures, fashion and accessories, mixed media works, experimental cat art, and more. The blog has been updated daily for several years now featuring recent works by young artists and encourages new submissions. Listen to the record on Travel By Good’s Bandcamp page or on the SoundCloud player in this article. See the record’s information on Discogs. Berlin based musician Florian Meyer creates complex poly-rhythmical electronic music under the name Don’t DJ. To perform and to create his music he uses a software program that I developed. Next to painting I’ve always been interested in music and computer programming. Five years ago I had an idea for a software program that generates complex rhythms in a visually clear and simple way. Rhythm patterns that sound like traditional African or Latin American rhythms but that are actually generated by a mathematical formula. The idea started with a paper I read by Canadian professor Godfried Toussaint about using the Euclidean algorithm to generate musical rhythms. It made me think of a way to turn this theory into an easy to use software program. I wrote the program and used it to make music. I also made it available online as freeware for anyone to download. Read an article about the Euclidean rhythms idea on my old programming weblog. For the coders: Source files on GitHub. Last year artist Thomas Baldischwyler who runs the Travel By Goods record label contacted me. 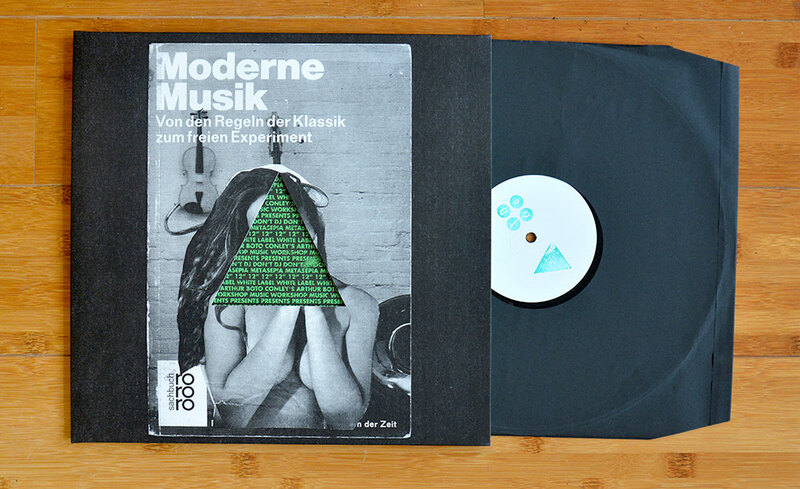 The next release on his label would be music by Florian Meyer. 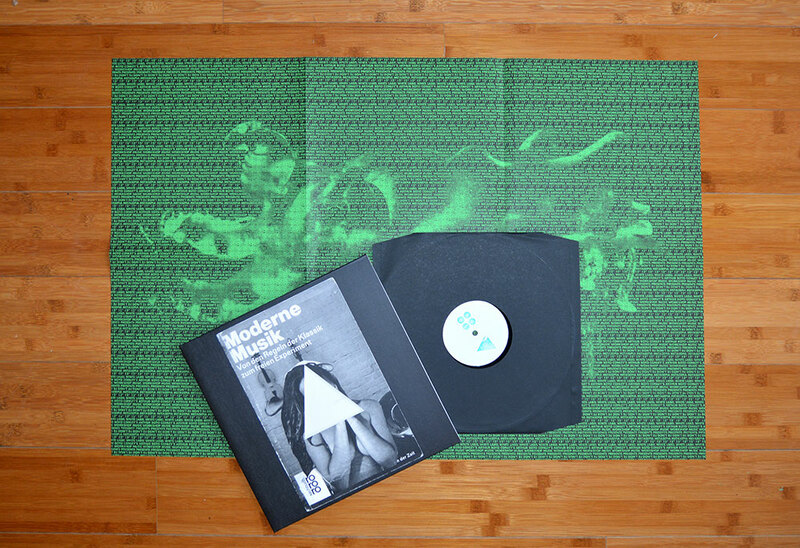 As Florian used my software for two of the three tracks on the record, Thomas had the idea to include a printed conversation between Florian and me with the release. A conversation between the musician who uses computer software to create his music and the computer programmer who invented and created the software might be interesting, he thought. Now, at the end of 2015, the record was released and is available in record shops and online. It’s a beautiful printed gatefold cover with triangular cutout in the front that shows the folded poster inside. The vinyl record itself has a hidden extra at the end: a locked groove! 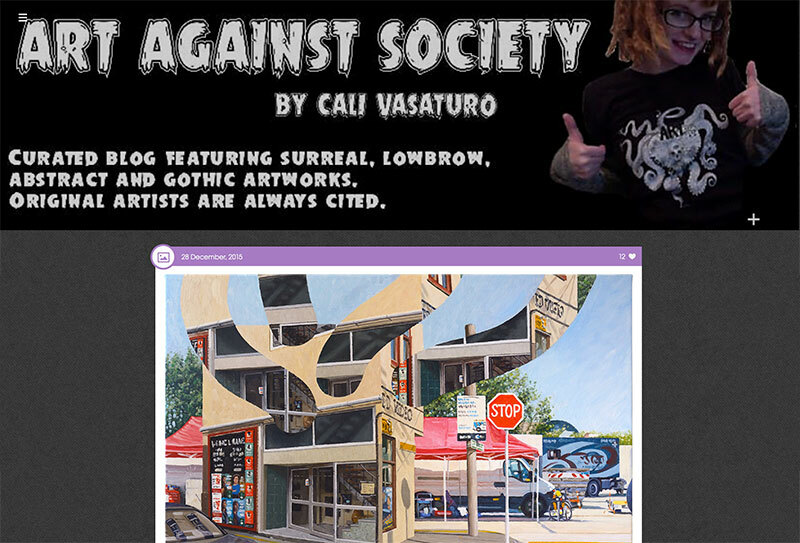 Art Against Society is a weblog that I like for it’s choices on the stranger side of art. I’ve visited it regularly over the past year and I am often surprised by the weirdness of the artworks. Surreal, lowbrow, abstract and gothic is what curator Cali Vasaturo calls it. Time to lace up the walking shoes and get out there in the fall air with some headphones and no particular destination. Let the music buoy your spirits and guide your steps as you wander in thought, observing the wild and weird world around you. 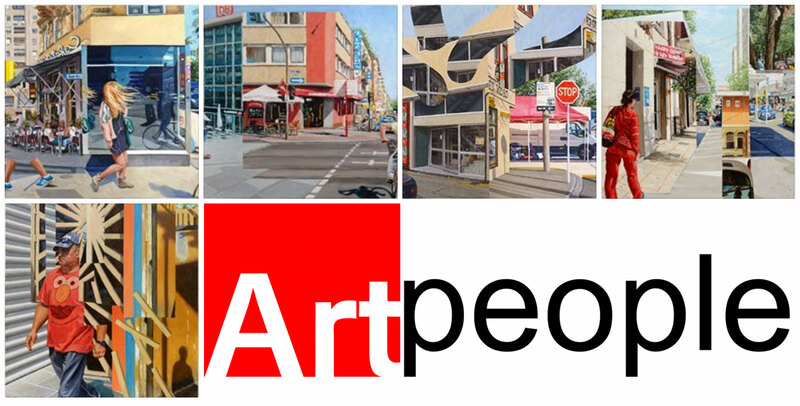 Art People Gallery created an album of my paintings on their Facebook page. More than 1000 likes already in the first week! Have a look at the Facebook photo album here. 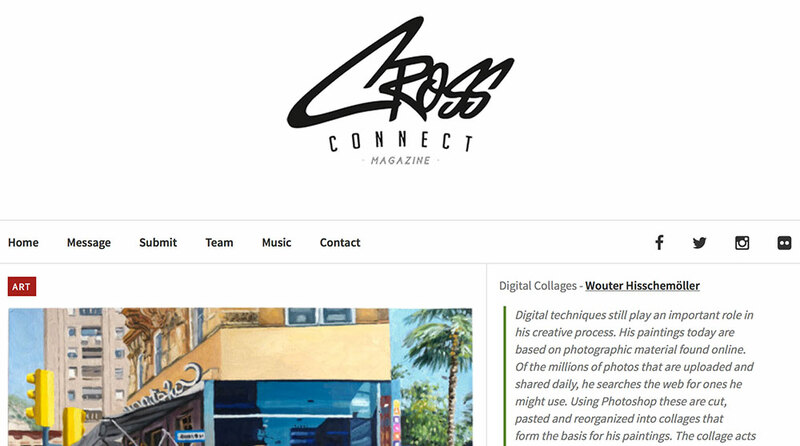 Cross Connect Magazine is a website maintained by an international group of artists, designers and enthousiasts presenting new art, music and design. 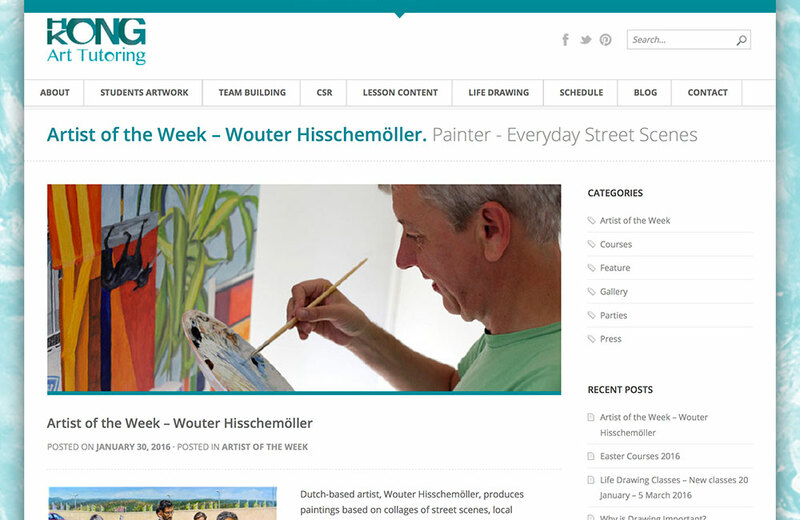 New articles about interesting artists and designers appear on the site daily. Cross Connect is a vibrant community comprised of content curators and artists. 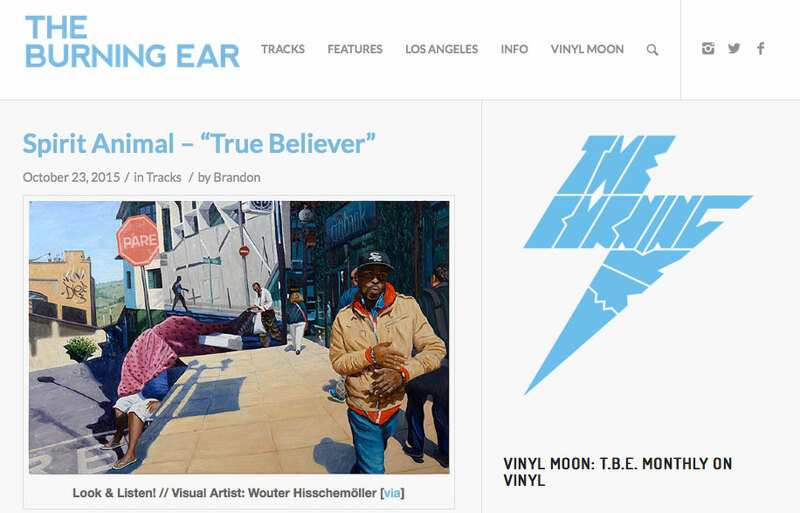 If you’re searching for a place to discover new art, illustrations or music, look no further. Every day we curate an assortment of content based on submissions from our readers, as well as recommendations and findings from our staff. We take pride in discovering new artists. Blend Images is the world’s leading multiethnic commercial stock agency. 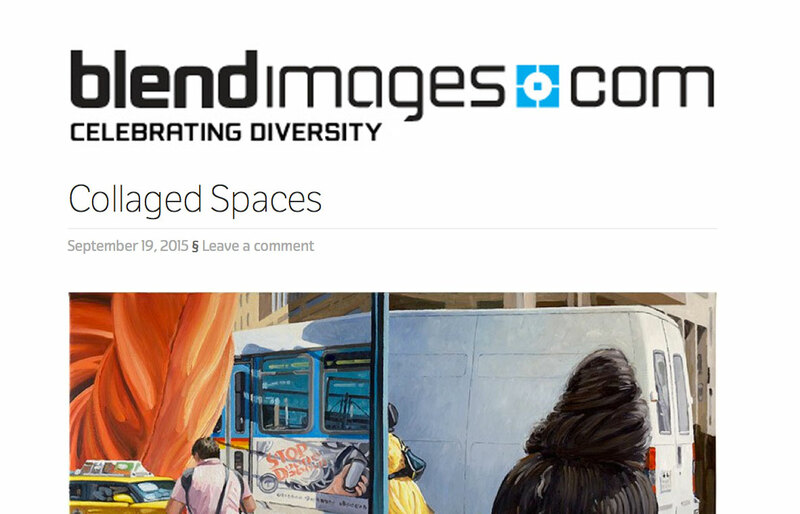 Founded by a consortium of the most talented and respected photographers within stock photography, and managed by key industry veterans, Blend Images has established itself as the premiere destination for ethnically diverse business and lifestyle imagery.